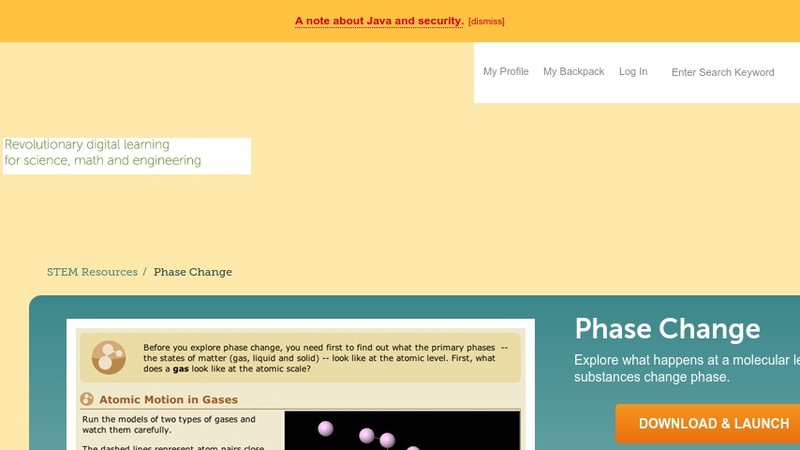 This interactive activity for grades 8-12 features eight models that explore atomic arrangements for gases, solids, and liquids. Highlight an atom and view its trajectory to see how the motion differs in each of the three primary phases. As the lesson progresses, students observe and manipulate differences in attractions among atoms in each state and experiment with adding energy to produce state changes. More advanced students can explore models of latent heat and evaporative cooling. This item is part of the Concord Consortium, a nonprofit research and development organization dedicated to transforming education through technology. Relate the domain of a function to its graph and, where applicable, to the quantitative relationship it describes. ?